We continue to develop innovative solutions to manage pressure on the grid when demand for electricity is high. PG&E’s demand response programs reward customers with incentives for reducing or shifting their energy use at these times, helping to lower costs, reduce strain on the system and ensure that PG&E is there when our customers need us most. We are also piloting new strategies to smooth out the intermittent flow of energy from renewable sources, such as wind and solar generation. PG&E’s demand response options are enabled by SmartMeter™ technology, which helps customers better control and reduce energy costs. More than 100,000 residential customers take part in the programs we offer, along with many larger commercial and industrial customers. These programs enable PG&E to take a more fiscally and environmentally responsible approach and avoid the need to build and maintain additional power plants that would only be called on for short periods throughout the year. Since 2012, as part of a plan by the CPUC, PG&E has been transitioning business and agricultural customers to a Time-Varying Pricing (TVP) electric rate structure that better aligns prices with the cost of generating energy at the time it is used. Under the TVP structure, customer rates are higher when electric demand is at its peak, typically during weekday afternoons. In return, customers pay lower rates at all other times. SmartRate Gives residential customers a discounted rate throughout the summer, with the exception of up to 15 declared “SmartDays” when their rates are higher as demand for electricity reaches its peak. In 2014, 130,000 customers participated in SmartRate and paid up to 20 percent less on their summer electric bills. SmartAC Sends a signal to a PG&E-provided device on a customer’s air conditioner during electricity demand peaks, cycling the air conditioner to use less energy. Offered during May through October, the program can provide about 90 MW of load reduction across PG&E’s system. Peak Day Pricing Provides business and agricultural customers with discounted rates from May through October. In exchange, prices are higher for energy used during designated peak “Event Days” and times (no more than 15 per year). In 2014, participating customers reduced their energy demand by more than 8 percent during these peak times. Aggregator Managed Portfolio and Capacity Bidding Program Works with demand response companies that aggregate customers together. These aggregators—and, by extension, the customers in their portfolios—act as virtual power plants and receive payments from PG&E in exchange for reducing load on peak days. Base Interruptible Program Customers agree to reduce their usage to a predetermined level during special emergency circumstances. Participating customers—typically large customers—receive financial incentives in exchange for their commitment to help ensure grid reliability. Demand Bidding Program Offers incentives to businesses for reducing energy usage during hot days. Unlike some other programs, this is a “best effort” program that gives customers incentives for reducing their usage but does not apply additional charges if they opt out on any given day. Automated Demand Response (AutoDR) Works with customers to identify specific ways to reduce electricity use during peak demand periods and provides them funding to automate their equipment. Then, during a demand response event, PG&E sends the equipment a signal that initiates a series of automatic, customer-defined and preauthorized demand reduction measures. To further encourage customer participation, both Peak Day Pricing and SmartRate offer bill protection, which reimburses customers for the first year if their bills are higher than they would have been under their previous rate plan. In 2014, we leveraged our programs on numerous occasions to reduce demand and ensure reliable electric service for customers. For example, in early 2014, our customers helped meet a CAISO emergency request to conserve electricity. Through our Base Interruptible Program, customers responded to a notification in 30 minutes and averaged a reduction of 184 MW over the four-hour event. We also continued to transition eligible small- and medium-sized agricultural customers to Time-of-Use rates, following the transition of similarly sized business customers in 2012 and 2013. A “Time for Business” mobile tour invited customers to learn what time-of-use rates would mean for their business and talk with local PG&E representatives about our programs and rebates. PG&E also continued to provide online tools, programs and services to help businesses thrive with Time-of-Use pricing. Customers can log in to our website to see a custom rate comparison and learn more about available pricing options. Through our demand response programs, PG&E and our customers had the ability to control up to 586 MW of customer load in 2014—about the capacity of a large conventional power plant. We will continue to offer programs that enable our customers to cut energy usage during periods of peak demand, helping to lower costs and benefit the environment. Through new data platforms and programs, we will also continue to enable third parties to take advantage of the Grid of Things™ and help ensure reliability as we integrate more renewable energy into the grid. For example, in 2015, we are launching a pilot that incentivizes customers to store energy or shift their energy use to times when energy supply is greater than demand due to high levels of renewable energy production. PG&E and automaker BMW are teaming up to test the potential for electric vehicle batteries to provide valuable services to the electric grid. If successful, the pilot program could pave the way for utility payments that could stimulate further customer purchases of electric vehicles. 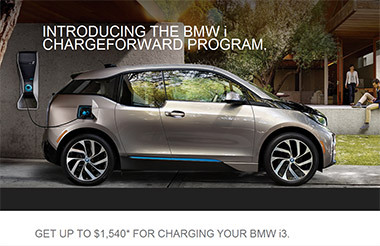 BMW has enlisted 100 owners of its new BMW i3 electric vehicles to take part in the pilot. During the test period, PG&E will send BMW an alert over the Internet, indicating how much load to cut and for how long. BMW then will signal the telemetry equipment in each participating vehicle, telling it to halt its charging for the duration of the event.